(Nanowerk News) University of Illinois researchers have shown that by tuning the properties of laser light illuminating arrays of metal nanoantennas, these nano-scale structures allow for dexterous optical tweezing as well as size-sorting of particles. "Nanoantennas are extremely popular right now because they are really good at concentrating optical fields in small areas," explained Kimani Toussaint, Jr., an assistant professor of mechanical science and engineering at the University of Illinois at Urbana-Champaign. "In this work, we demonstrate for the first time the use of arrays of gold Bowtie Nanoantenna Arrays (BNAs) for multipurpose optical trapping and manipulation of submicrometer- to micrometer-sized objects. We think that this could be a fruitful area to pursue, particularly because of the growing interest in lab-on-a-chip devices." According to the researchers, the excellent field enhancement and confinement properties of BNAs enable highly efficient, optical tweezers which permit high-speed manipulation of submicrometer to micrometer-sized objects in aqueous environments using remarkably low-input power densities. These characteristics could be useful for optofluidic applications (e.g., lab-on-a-chip devices), manipulating biological matter with reduced specimen photo damage, formation of optical matter, and basic physics studies of colloidal dynamics. "In contrast to other plasmonic tweezers, we find that BNAs permit particle trapping, manipulation and sorting utilizing only the optical parameter space, namely, low input power densities, wavelength and polarization," said Brian Roxworthy, a graduate student in Toussaint's research group and first author on the paper, "Application of Plasmonic Bowtie Nanoantenna Arrays for Optical Trapping, Stacking, and Sorting," which appears in the journal Nano Letters ("Application of Plasmonic Bowtie Nanoantenna Arrays for Optical Trapping, Stacking, and Sorting"). 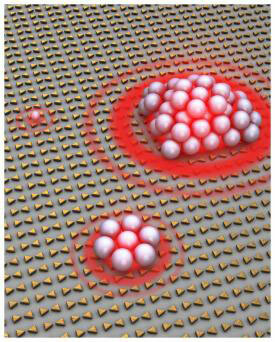 Using empirically obtained "optical trapping phase diagrams" to achieve the desired trapping response, the researchers demonstrated several types of particle manipulation, including single-beam optical tweezing of single particles over the entire nanoantenna area, single-beam optical tweezing of 2D hexagonal packed particles over the entire nanoantenna area, and optical sorting of particles by size; stacking of submicron to micron-sized particles in 3D. According to Toussaint, this is the first demonstration of a range of particle manipulation behavior for a given nanoantenna array. "We actually excite our nanoantennas off resonance, which to our knowledge is a first, and at the right input optical power, we take advantage of thermal effects combined with optical forces to enable tweezing of tens of particles at a time," Toussaint explained. "We show that very low power densities are required to achieve the aforementioned behavior. For example, we were able to carry out experiments using a standard laser pointer."